Dr. Cynthia (“Cyndi”) Rachal has a bachelor’s degree in Animal Science from LSU. She graduated from LSU School of Veterinary Medicine in 2009. Dr. Rachal loves all aspects of medicine, but her favorites are dermatology, geriatrics, and dentistry. She is married to Mike, together they have two daughters Marie and Bella and one son, Alex. They share their home with two dogs, Rose and Max, and their cat, Chase. Dr. Kelsey Hubbard is a 2018 graduate of St. Georges University. She is originally from Aledo and is excited to be back in the DFW Metroplex. Dr. Hubbard completed her undergraduate work at Oklahoma State University. Dr. Hubbard has a cat, and a Grenadian Pothound that she brought home from the Carribean. She has special interest in surgery, including orthopedics and is looking forward to meeting you and your pets. Dr. Barber graduated from University of Illinois in 2006. She lives in Fort Worth with her son and 2 cats, all of whom out-rank her in the house. Her languages include English, Feline, and Chihuahua. 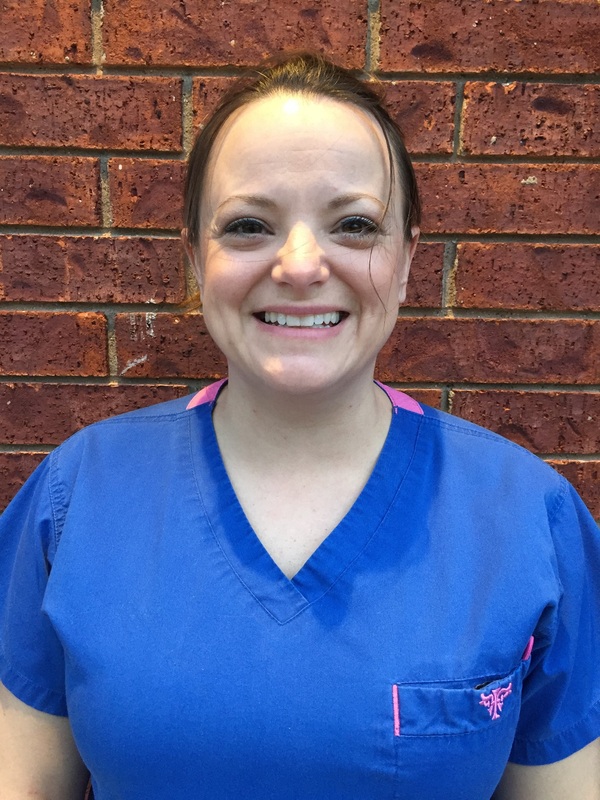 Dr. Katherine Sternitzke graduated from Louisiana State University School of Veterinary Medicine in 2018; she also received her bachelors from LSU in 2015. After being in Louisiana for 8 years, she is happy to be back in her home state. Dr. Sternitzke has 2 standard poodles and 2 black cats. She has a special interest in exotics and zoo medicine and is excited to meet your feathered, scaled, and furred babies! ​Jazmine is our Practice Manager and Lead Technician. She has over 35 years experience in the veterinary field and has been with our clinic for over 27 years. She has two daughters, Montana and Nevada. Included in their family are 1 Maltese, Cleo and 1 cat, Icabod both rescued. Jazmine loves riding her motorcycle and camping with her family. Vanessa is our Head PM Technician. She is originally from southern California and has always loved animals. Her free time is spent with her husband, their two dogs Bailey and Kaylee, cat Harley, two rats Lila and Louisa, and Kiwi the parrot. Durisa is our Head AM Technician. She has worked in the veterinary field for 14 years. Durisa lives with her three children. She also has five dogs, three cats and fosters in her spare time. Durisa loves to cook and spend time with her family. Michele is our Head Receptionist. She is new to the veterinary field. Michele is an athlete and she teaches group ballet and fitness. Michele also trains police and civilian K-9’s. She loves animals and has three dogs of her own, Simper, Recon, and Pippi. Montana is one of our Technicians, she has worked her way up from Receptionist to Technicians Assistant to Technician over the last 5 years. Montana is the oldest daughter of our Practice Manager Jazmine and has two cats, Maizie and Maui. She loves working out, camping and traveling. Melissa is our newest Receptionist. She is new to the veterinary field, but has always loved all animals. Melissa lives in Arlington with her two children Bella and Travis. She enjoys taking her kids to the skate park or spending time with family and friends. Brandi, our afternoon receptionist, is new to the veterinary field. She lives in Watauga with her husband, three children, two dogs, and cat. Brandi loves to cook and hang out with family and friends. Keirstin is our AM Kennel/Surgery assistant. She has been grooming the last few years and has decided to expand her knowledge in the pet industry. Keirstin loves music and crafts. Emmi is the newest member of our team. She is our pm Kennel Technician/Assistant. Emmi has been in the veterinary field for several years. She has a daughter Alexis attending UTA, a Pit Bull Sugar, one cat Waylon , and a turtle named Liz. Emmi enjoys the gym and spending time with family and friends. She loves all animals and can’t wait to meet yours.